A controversial literary critic and commentator, Joseph Ritson (1752-1803) made his reputation identifying and exposing literary forgeries. His enduring legacy, however, stems from his interest in the legend of Robin Hood. The combination of his passion for collecting literary antiquities, particularly medieval ballad poetry, and his political convictions in support of republican government, drew him to the tale of the English outlaw. This two-volume work, first published in 1795, is an important collection of texts relating to the legend. Ritson's aim was to present all the known poems and songs, and his research was so thorough that very little further material has been found since. 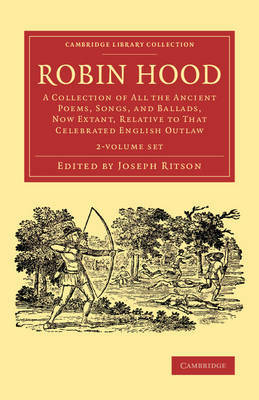 This work helped transform the perception of the Robin Hood tradition, encouraging its serious study. Ritson's volumes have been reissued many times since their initial publication. Each text here is accompanied by engraved illustrations, and both volumes contain a glossary.